Happy Tuesday Ya'll! Katie here from The Mishaps and Mayhem of a Solitary Life! I'm so excited to be back here today on The Blended Blog! 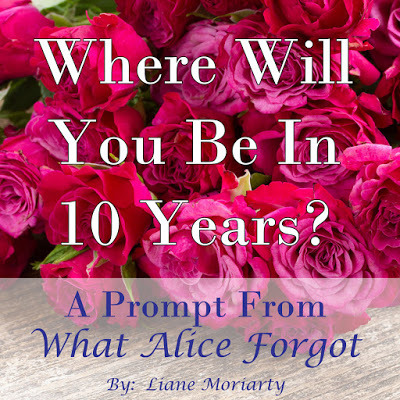 On tap is 10 Years Forward....our series based on the book What Alice Forgot by Liane Moriarty. I have been reading like a Mad Woman all weekend to finish the book in time for today's post!! I didn't but am so close and totally loving it. It's about Alice who has a bad fall during Spin Class, gets a concussion and wakes up only to realize she has lost 10 years of her life and nothing is as she expected it to be. Which brings me to my 10 Years Forward! I'm not going to lie. This has been difficult! I'm not sure if it's because I've never thought about this before or maybe because a little part of me is scared to! The rest of the TBB girls can envision kids grown up and a life with their spouses. Me, the single girl of the group, is too afraid to see any of that. 10 years from now, I'll be firmly holding at 46. I was always one to say I never had to get married, but that doesn't mean I want to be alone the rest of my life. Maybe ten years from now my prince will have come and we will be living happily...traveling together and enjoying the good life...fine wine, good food, lots of laughs and millions of memories together! I know I'll still be surrounded by and spending time with my family and friends! Probably reminiscing about that crazy summer of 2016! Ha! Ten years from now I will be entering my 25th year of teaching. I'll still be teaching. I know I complain about it often, but I've never wanted to do anything else with my life...and I won't! 25 years in teaching seems like a long time, but then thinking of my age, 46 is still young...I could have an additional 20 years a teaching still ahead of me! Yikes...maybe that prince I'm waiting for will be rich and fabulous and I won't have to work after my 25th year! All in all, I just hope I'm healthy, happy and still enjoying life! Oh and I want to still be blogging, of course! !